In just less than 1 week, we will bid goodbye to the year 2017 and welcome the year 2018. I looked back at my goals for 2017 here. Honestly, I didn't really remember what goals I set for myself. 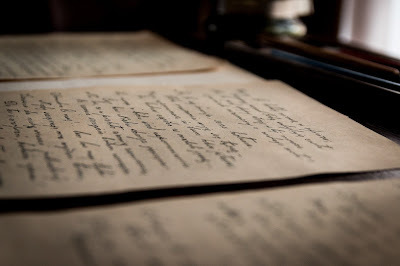 The best thing about having a blog is that I can read back on what I have written. Honestly, I haven't been thinking much abut retirement this year. 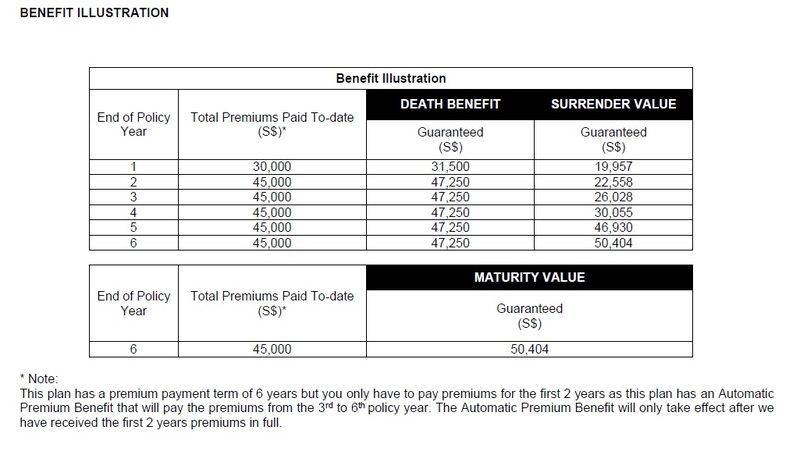 I've been thinking should I top up my CPF SA to get more interest and plan for my retirement but did not do so until now because its going to be lock in for a long time. It will probably be a good idea to put money in my CPF special account because I will get 5% interest. My CPF SA has not reached the first $40,000 yet. I will continue to give it a good thought and may top up sometime this week. There will also be tax savings through cash top up. This was a challenging year taking up a completely new role in a new company. The biggest challenge was when one of the team members left and I was tasked to take on his role which is the biggest among the others in the team. I was actually quite scared to take on such a big role just 2 months into my new job but still survived in the end. I'm glad I stuck it out and persevered to the end even though it was really tough and I thought of giving up many times. The working culture was also very different from my previous company. I realised its through getting out of our comfort zone where we will really learn. I did learn a lot this year. In order to save more, I embarked on a journey to increase my income. I wrote it in a separate article here on the income I managed to create. Out of all my income, I managed to save about 64% even though expenses increased. This is more than the 50% savings I set out for. If i didn't create additional income, savings rate would have been about 30% only. This is the toughest part personally for me this year. Not that I didn't have time for relationships but unforeseen circumstances happened to people around me this year. Life has its ups and downs. 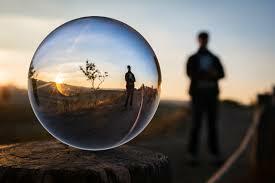 The people around us may no longer be the same or even may no longer be around before we know it. I learnt to not take for granted the things we can do now because we may not be able to do the same thing again in the future. Even simple things such as eating, walking we should not take for granted. Life is short. Treasure the people around us and enjoy what life has to offer. Yes, planning for the future is still important but try not to over plan. There is a season and time for everything. This should be my last post for 2017. Here's wishing all a happy new year ahead! May 2018 be a great year for you! Stocks portfolio tracking can be quite a tedious task. I used to key in my transactions into excel individually and it took up quite a lot of my time as I still had to track my dividends and investment returns as well. However, over the past 1 year, I manage to track my stocks portfolio automatically through a website called stocks cafe. I personally know a few other bloggers and fellow investors using it to track their stocks portfolio as well. It is really easy to use and best of all it sends report on my investment results to me every single day so I got an overview on how my portfolio performed. There are also details of each individual stock and how they performed for the day in the email. This allows me to have a summary of what is going on in the market when I have no time to look at my stocks while at work. The first news I see is on Suntec REIT which is a stock I have in my portfolio. There are many other news when you scroll down. When I click on my stocks portfolio, I get the details of each individual stocks I have in my portfolio. 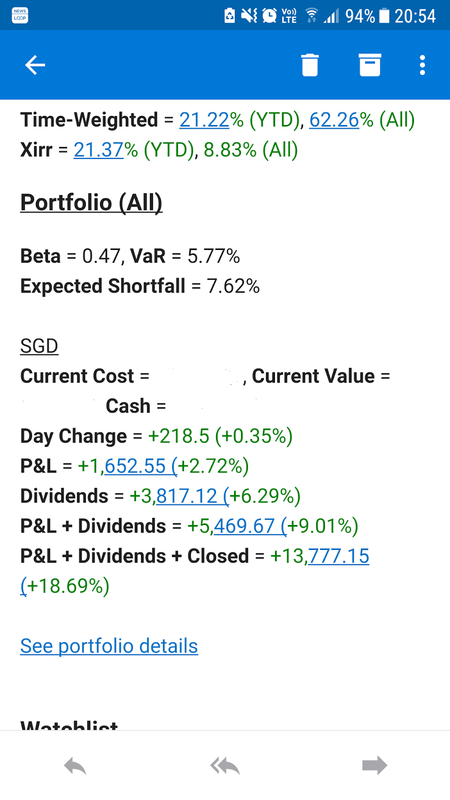 I can see the % allocation of the stock in my portfolio, the dividend yield, my average price, the profit and loss and also the dividends I received. This is more than enough to give me an overview of how my stocks are doing and how I can re-balance my portfolio when needed. I can also see the dividends I received and the dividend yield of my portfolio. There are also details of how much dividends I received from each stock and the projection moving forward. As seen below, I still have one final dividend not yet paid out from Singtel even though it has already XD. And finally, I can even see my portfolio performance for the current year as well as the past few years. XIRR has been exceptionally good this year at more than 21%. Firstly, we can see the stock chart. This is particularly useful for me as I will always at least look at the chart before I buy the stock. I want to try to buy a stock at good support levels. Next, I can see basic information of the stock including its fundamentals and basic description. Basic financial ratios such as PE, PB, ROA, ROE and also dividend yield can be seen. As mentioned earlier, there is a link to the company's investor relation page under the general section which we can click through to get more information and do deeper research on the company. Stocks cafe has been useful for me as a portfolio tracking tool and also a platform I am using if I want to find more about a stock. It has served me well for the past 1 year plus. It is free to use but there are some limitations for free users. You can try it first to see if its useful for you. The holidays are coming as well as the end of 2017. Here's wishing everyone Merry Christmas and happy holidays ahead! Soon, I'll be turning 30 in 2018. 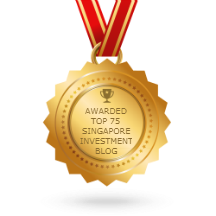 I'm growing older each day with this blog even though its still called SG Young Investment. This blog will always stay young and continue to inspire the next generation of young people even as I grow older. There are many decisions which I have made in the past 10 years, some good while some not so good. This is a letter which I would write to my 20 plus year old self which shows my life journey and also what I've learnt so far. Hopefully through this letter, you would be able to learn from some of the decisions I made and if you're in your early 20s or younger, this letter will hopefully let you make wiser decisions and motivate you in your life. Life is always a roller coaster. It is also an unknown what will happen 10 years later. But one thing for sure is the decisions we make in life will somehow determine our future. However, fate still determines some key milestones in our life. At the age of 20, you will go through a major milestone in every Singaporean boy's life, that is serving national service. The experience will show you that life can be pushed to the limits even when we think we can't do it. If we persevere on, we will see results. The spirit of never give up is born in the army. It is also during this time when you will start to get serious about your life. What shall I do in my life is the question? There were actually few choices left since your polytechnic results were not that fantastic to get into a university. You also did not know what to really further your studies on. The decision was made to just work in the same field which you studied for your diploma. Through scrimping and saving, you managed to save your first 5 figure savings of only $10,000 at the age of 21. Money was the focus after you came out of army. Receiving just a salary of $1700 was the largest amount you have ever earned a month since you were born. Yes you had worked several part time jobs in the past but this was the first full time job. Not knowing what to expect is always on your mind before the first day of work. Through working, your savings manage to increase and because of the frugal lifestyle, you could even save $20,000 a year. Stepping into the working world wasn't a bad experience. The colleagues were nice, the boss was nice and the working culture was good too. You were the youngest in the company and people took care of you and often giving you advise of life. Some were about your father's age and listening to them gave you some perspective of life from different people, their regrets and their achievements which they were proud of. You listened attentively day in and out and got some really good lessons from some of these older and wiser people. Many people regretted staying too long in the company and always advised you to further your studies and advance in your career. After much consideration and deliberation, you decided to take up a degree course of economics which was completely different from the engineering which you studied before and what you are working as. It was a very tough choice coupled with having to balance both work and studies at the same time. The few years, no doubt were tough, but also the most fulfilling time of your life. Even as you studied part time and worked full time, this blog was born because you found the passion for financial stuff. You met more like minded people, made new friends, did stuff which you never thought you could do such as public speaking, attending conferences and events and talking to successful people at the top. You graduated with the degree eventually and never regretted the decision you made. Even though you reminded yourself not to stay in the company for too long, you still did. After graduation, you continued staying in the company for another 2 years. Was it a wrong decision? It is really very hard to tell. Getting out of the company earlier will allow you to advance your career faster but you may not have met some people or have done some stuff if you had left earlier. But really who knows what really would have happened if you had made a different decision. Still, staying in the same company after graduation seemed to allow you more time to focus on life beyond work. You met your girlfriend during this time and life changed after that. Fortunately or unfortunately, as a guy in the relationship, your expenses increased. This motivated you to think about increasing your income instead of just trying to save money. I could spend lesser alone but I don't want to save on my partner. So, the journey to embark on increasing income started from then on. Fortunately, opportunities presented itself even when you did not really look for it. The goals were mainly focused on savings beforehand but it changed to creating income thereafter and things just worked out accordingly somehow. On investing, you tried all sorts of style and attended lessons outside but mostly did not work out at the start. Investing only worked when you found the style that suits you and never think of making money. Its a psychological game of greed and fear afterall. Once these 2 are removed, investing is much more easier. Through this life, you learnt that people matter in your life. It is the people around you which make life interesting or sad. So, it is important to surround yourself with the right people in your life. The right people will motivate you while the wrong people will drag you down. The rest of the plans such as setting goals are but a road map on the destination which you want to reach. In the end, its the journey that matters. Just like planning for a holiday, we do not focus on reaching the destination only but enjoying the journey to the destination as well. The time spent with the people along this journey, the experience experienced goes a long way in our memories. Therefore, enjoy the journey while reaching your goals. Are there any regrets in life? Most probably yes but I think everything happens for a reason. Instead of regretting, focus on the future and get back on the path which you set out initially. Sometimes, we may have gone off course but there is always time to get back on track. To my 20 year old self, there is still a long road ahead. Life will be good as long as we believe it. Never give up on your goals. 2017 has been a crazy year for me. Firstly, this is the year I spent the most. My expenses almost doubled from a year ago. This was probably the result of me foregoing tracking my expenses like how I used to in the past. My goal in 2017 was still to save at least 50% of my income which I would not have been able to achieve if I just relied on my main income alone. In 2017, I changed job for a higher income role. It didn't really make up for the increase in expenses. My savings rate would have suffered tremendously. However, because of a change in focus, I didn't just complain that my salary was low and sit there and do nothing. In the end I managed to revive my savings rate and save almost 100% of my salary for 2017. How is it possible to save 100% of my salary? The reason is simple, it is the answer to financial independence too. I created more side income (lots of it), to cover almost all my expenses. 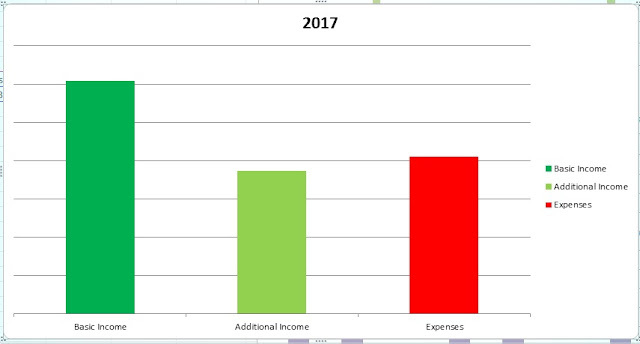 Even when my expenses doubled, I still created more side income to cover it. This is the strategy of financial independence which I learnt from the book "Rich Dad Poor Dad" almost 8 years ago. In the book, it taught me to use assets to create cashflow that puts money in my pocket. Do this until it covers all your expenses and there you have achieved financial independence. Although the book talks more about investing in real estate for cashflow which is difficult for average Singaporeans, the concepts taught were still applicable. The additional income created is almost enough to cover my expenses for 2017. The expenses are not in thousands but in tens of thousands so it wasn't easy creating the income to cover it. It took time and effort and lots of hard work. It is a far cry from the passive income which we are all familiar with. With the additional income created, I am on track to save almost 100% of my basic income in 2017. If not for this, just by relying on my main income will achieve only a savings rate of about 33%. There are many ways to create income by doing what we enjoy and using the skills that we have. The world has changed and we can virtually work anywhere in the world. Yes we all want the passive income so we can sit back and relax and wait for the money to come in but that does not happen overnight. We have to create active income first then slowly transform it into passive income. This is my strategy for next year and moving forward for my life. Active income is necessary to create passive income. Without cash, we can't buy assets that generate passive income. For now, our assets are our hands and legs and our mind and skills which we can invest in to generate active income. I have created 3 diagrams below which sums up my strategy and which also explains the path to financial independence and retirement. The first chart below will be where most of us are at. In fact, most people do not have the side hustles part where you have created additional income. Side hustles is a word very well known in the west where many of them leverage on technology and freelancing to create more income. This accelerates the path to financial independence if we can save more from the additional income. If you manage to get a high main income and can still save quite a sum of money at a young age, then side hustles will be optional for you. However, there is a problem with relying on main income only which brings me to the second diagram. The second diagram is where we can depend on our side hustle to continue living our life. The main income is removed in this case as we no longer need it. Most of the time, we will be doing side hustles which we like and there is always the freedom from office politics and all sorts of nonsense in the corporate world and the rat race. This is the gig economy which I wrote about in a previous article. There are about 9% of the workforce in Singapore who are in the gig economy as compared to 30% in the US. When we do not need to depend on a salary to continue living our life, then we would have effectively gotten out of the rat race. The real financial independence will be on diagram 3 below. In diagram 3 below, this is how financial independence will look like. We are able to generate enough passive income through out investments to cover our expenses. At this stage, we can choose not to do any work or continue with the side hustles we like to do. The main benefit here is the freedom from the work which we do not like. It is not difficult to chart the path to early retirement. The maths shows that it can be done and how it can be done. 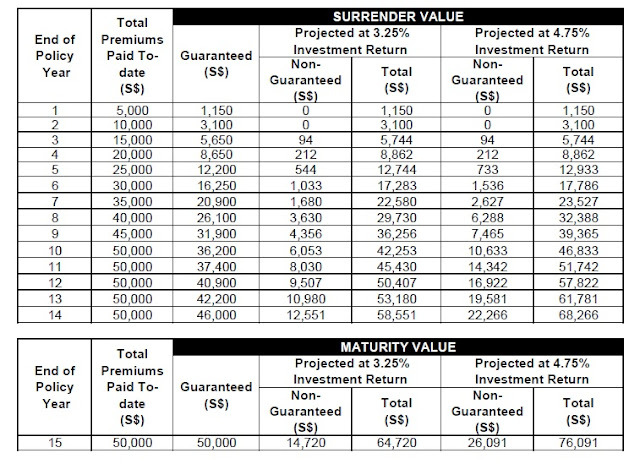 The maths shows that just by saving 75% of your income, you can retire in 7 years base on a 4% withdrawal rate and assuming your expenses stays the same. In Singapore, many people do retire in their 40s. It is achievable as what has been done by various financial bloggers. What they do is they save and invest early in their lives and also try to earn a decent high income. 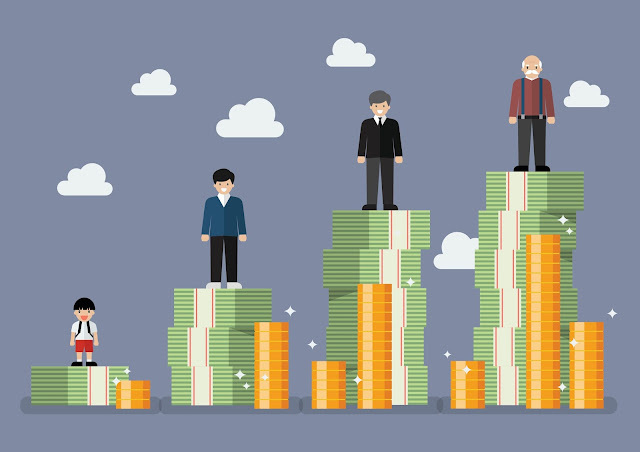 Most generate additional income through other means as well including investing in stocks, properties or freelance. As for myself, I have the option to call it quits for my job and still be able to continue living my life but I'm not going to do that anytime soon. There's still a lot more work to be done to stabilise the foundation. One thing for sure is I'm looking to do more meaningful work instead of just working for money. Many things have happened in 2017 which changed my perspective of life. Seeing my loved ones falling ill one by one is not an easy thing to go through. Life is definitely more than working. The stress and burdens that creates the illness is not worth it at all. Many people see the dramatic positive effect to their health when they stop working in the corporate world and have the freedom to do things they like. High blood pressure, back pain, headaches, gastric disappear when people stop working. Those are health problems that comes with stress and can cause even serious life threatening illnesses. We should know when to stop but its easier said then done when you have no choice but to continue working. When you have a choice, then you can choose your health over the work. We can all aim to be financially independent one day. The Dangers of Credit Cards And How To Use It Smartly? All of us know that credit cards can be dangerous if we overspend and end up not being able to pay the bills on time. The interest on credit cards is extraordinary high because it is an unsecured debt, different from home loans which are considered secured debt. Interest on credit cards are around 24% which is 2% a month if we could not pay the full sum. There are also advantages of credit card which we will explore in the later part of this post as well. There is always a minimum sum we have to pay on the credit card bill. It is always important to pay your credit card bills in full and NOT just the minimum sum. Paying just the minimum sum will incur the interest on your outstanding amount. The minimum payment will be used to pay the interest charge first before reducing the outstanding balance. So, out of the minimum sum of $50, after deducting $20 to pay interest, there is $30 left to pay down the outstanding balance. As we can see, even just $3000 outstanding credit card bills can take as long as 5 years to pay up if we just pay the minimum sum only. It is not advisable to delay any of your credit card bill payments as the interest is unbelievably high. If you do not even pay the minimum sum, your credit rating will be affected and it will affect your eligibility to get any other loans later. Legal action will also be taken against you if you continuously fail to pay the bills. Advantages and benefits of credit cards - How To Use it smartly? However, credit cards can also be beneficial for those who know how to use it to your advantage. I've heard and said a lot about the different cards out there (cash back, miles card, discounted items etc) which all helps us to be smarter in our spending. I also have some of the cards myself and it has given me lots of cashback and benefits. In this post, I will specifically look at which card is the best for each of our life stages. Before we get into the specific cards, I would like to offer a deal to all readers here. If at the end of this post you do not need any credit card or even if you applied for a card yourself, you can consider signing up as a referral and refer any friends whom you think will need any credit cards. You will get $25 choice of vouchers and your friend will also get extra $25 choice of his/her vouchers as well (choice of vouchers include NTUC fairprice, Grab, Lazada or Qoo10). Click here to be a referral. For fresh graduates who just started earning a decent pay above $30,000 annually, a basic cash back card is a good one to start with. Both Standard Chartered and American Express provides good cash back cards with no minimum spend and no limit to the cash back you can get. Its a simple card with no strings attached. You just get cash back on everything you pay with your card including student loans or any other bills etc. The cards to consider is the Standard Chartered Unlimited and the American Express True Cash back credit card. Both cards give 1.5% cash back on all spend without any minimum spend. For the AMEX card, they even give you 3% cashback on the first 6 months. 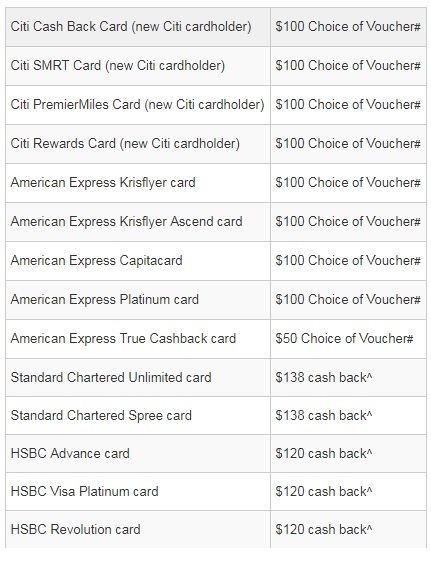 If you want to up your cash back even further, you can consider the Standard Chartered Spree card which was just launched recently. This gives you 2% cash back on all online and contactless transactions. Its what most young people will be doing nowadays. For couples getting married, there is sure to be some big expenses for the photo shoot, the booking of the banquet and so on. These big expenses can be greatly taken advantage of using the right credit card. Apart from the above cash back cards, miles card are the best for couples getting married. 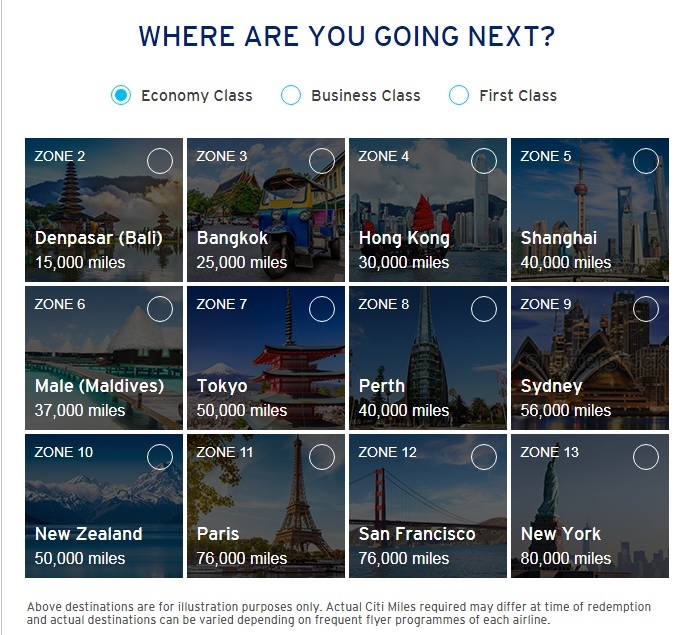 The Citibank Premier Miles card has the best miles offer now. It is especially good for couples getting married as they give bonus miles upon $10,000 spending in the first 3 months. Paying for the wedding expenses easily goes above $10,000 in this case. 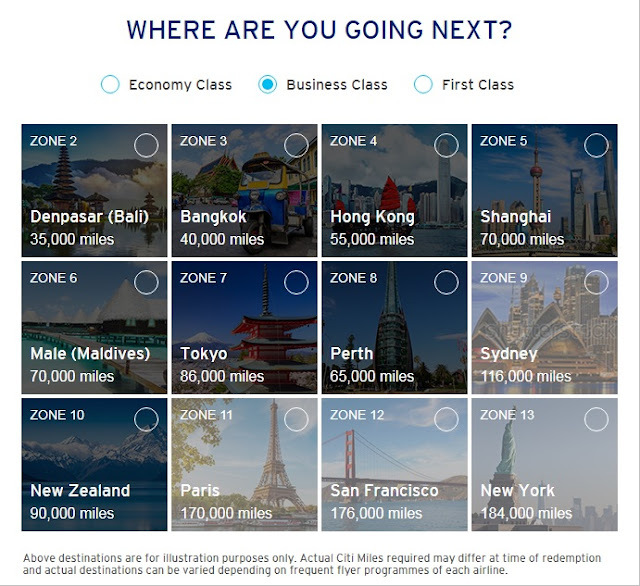 For the Citi Premier miles card, they give 15,000 miles on your first spend (any amount) and additional 27,000 miles upon $10,000 spending in the first 3 months. This is already 42,000 miles which you get as a bonus. For wedding expenses especially the banquet, it can easily cost more than $40,000 for the banquet alone ($1200 per table x 35 tables=$42,000). As the Citi Premier miles card earns 1.2 Miles for every dollar spent, this is additional 50,400 miles earned. For economy class, the miles can bring you to almost all countries across the globe. You can easily get free tickets for both you and your spouse on a honeymoon to Maldives or even New Zealand. You can even fly for free in business class to some of the countries below. The miles card doesn't just apply to couples getting married but also individuals and families who likes to travel. Share this with your friends who are getting married or who love travelling. Many more cards available with vouchers up for grabs here. How To Be A Referral And Earn $25 Vouchers for each friend you refer? Not interested in any cards but want to earn vouchers? Be a referral and refer your friends to sign up. You and your friend can each get $25 choice of vouchers (NTUC fairprice, Grab evouchers, Lazada or Qoo10) for each successful sign up. Sign up to be a referral here. After you get your referral code, simply refer them to my blog post for them to apply for the cards above or just send them this link to apply for any cards they need. Nowadays, I seldom have much cash in my wallet. Wherever I go, as long as credit cards are accepted, I'll just use paywave to make the payment. Its easy to use and I get the benefits by spending smartly as well. 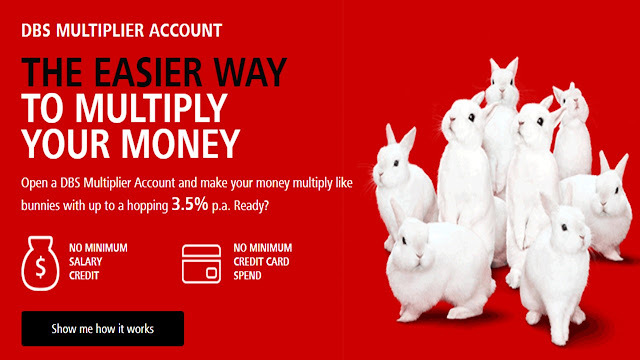 I even pay all my credit card bills through my OCBC 360 account to get the higher interest. However, always remember never pay just the minimum sum for your credit card bills. Make the payment in full and on time to avoid interest charges and late payment fees. This is the smarter way to spend. SG Young Investment is an affiliate partner of singsaver.com.sg so I get a referral fee for every sign up. How time flies, its near the end of 2017 already. 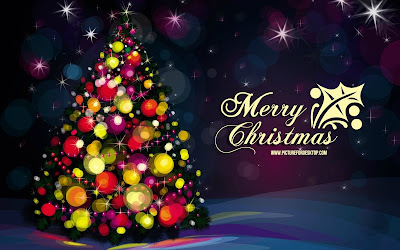 We are now in the month of December which is just less than one month away from the Christmas and new year celebrations again. In this post, I will do a summary of my investments and what has happened in 2017. Nearer to the end of the year or early start of next year, I'll write another post on the investment strategies for 2018. For 2017, it has been an extraordinary year for investments. You may ask how extraordinary is it? 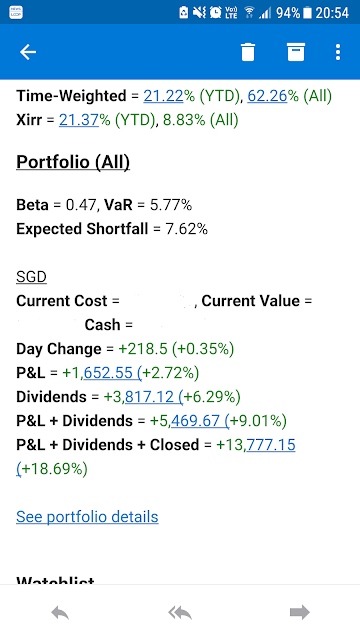 Using the Straits Times Index as a benchmark, if we have invested at the start of the year and did nothing, it would have gained about 18% return on investment by now. The STI ETF started at 2.95 at the beginning of the year. It is now at 3.48. I did invest some of my money into the STI ETF back when it was $2.80 last year. To date, it has gained over 30% inclusive of dividends. For this year, I only had 14 buy and sell transactions. Most of the stocks were bought near the end of last year where I thought valuations were attractive back then. Some of my stocks were acquired, especially the Japanese Reits, which had been a good income investment (7%-9% dividends) and also capital gain (more than 80%). For 2017, I invested more into the hospitality sector namely Far East Htrust. I also subscribed to the rights of CDL Htrust. Both investments have been good especially CDL HTrust which has seen its value went up close to 30%. I also invested into Comfort Delgro seeing the distress in the taxi industry. It has yet to be proven whether this investment will work out so there's still much monitoring to do. There was another rights issue by Capital Commercial Trust (CCT) which I also subscribed to it. I manage to get quite a lot of excess rights which was a bonus. The investment in CCT has gained over 50% (inclusive of dividends) to date. Office Reits are performing quite well currently where there are expectations that office rents and occupancy will continue to do well. Another investment I have in office Reits is Suntec Reit which also provides stable dividend income for me. All in all, the average dividend yield of my investment portfolio is about 5.14% and the XIRR this year is around 21.17%. My portfolio value is slightly above $60K now. The next plan will be to increase my investments to $100K whenever opportunities to invest comes my way. There remains a few weeks left to the end of 2017. I may still have some other transactions in December and also there is one more dividend from Singtel where there will be a special dividend paid out. We shall see how the market performs for the rest of the year. Elsewhere on the news, Bitcoin has been really hot these days where I see people everywhere talking about it. This is a sign of a bubble which we do not want to see. I'm not into this investment and will stay away from it as far as I know. It is never a good thing to have greed in investments. Its earnings season again which means time for more dividends. I've owned Reits for a long time now where I can get stable and recurring income from these investments. Shopping mall Reits are attractive in Singapore and 2 of the most popular ones are Capitaland Mall Trust (CMT) and Frasers Centrepoint Trust (FCT). CMT and FCT both reported their financial results just a few days ago and I must say shopping malls in Singapore are still quite resilient. The management of the malls is quite important as I personally saw a few malls become dead because of incompetent management. CMT and FCT are not the incompetent ones. For CMT, its 3Q financial results is nothing spectacular. DPU came in flat at only +0.3% year on year. The closure of Funan for redevelopment has affected its DPU as rental income decreased without Funan in its portfolio. Fo other malls, net property income remain largely unchanged. Its NAV is currently at $1.95 and share price trading at $2.03. 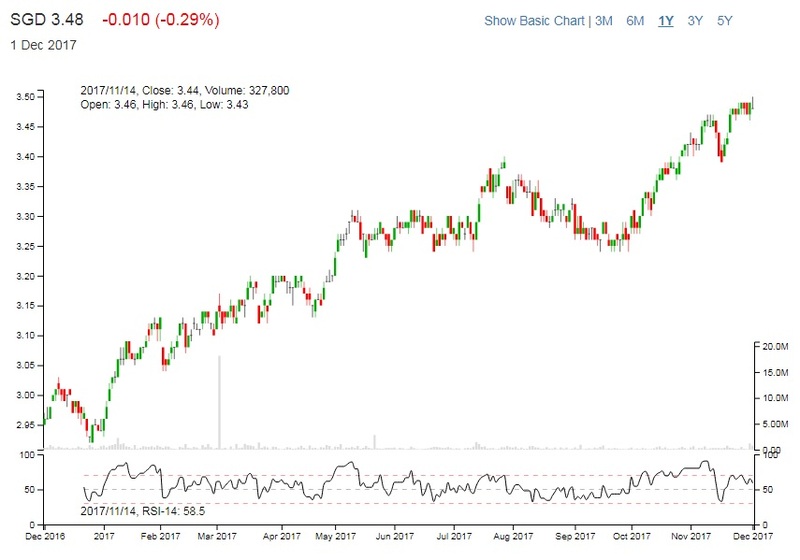 Its still a stable Reit to hold for the long term where I bought it back at $1.88-$1.90. I will still be holding this stock for its dividends. Dividend yield is about 5.5% base on current price. Frasers centrepoint trust is another resilient shopping mall reit which I have in my portfolio. It reported strong 4Q17 results where DPU rose 5.5% as compared to last FY quarter. Its portfolio occupancy rose to 92% from 89.4% and rental reversion was +8.3%. FCT has delivered 11 years of consecutive DPU growth. It is quite impressive to be so resilient and still has some steady growth. Artist impression of the new Northpoint city. This is the shopping mall at Woodlands. There were renewed and new leases signed which contributed to a 2.5% increase in rental rate. The shopping mall right beside Expo MRT is doing well too. Higher rental rate from renewed and new leases signed, and improved occupancy contributed to an increase of 13.6% in revenue. The only lagging mall in FCT portfolio is Bedok point which saw a drop of 26.4% in revenue. However, it is only 2.8% of all of FCT's NPI so it isn't much of a concern. The largest contributor comes from causeway point at 50.6% of FCT's NPI. Causeway point occupancy rate is still impressive at 99.5%. Northpoint city will be the next major contributor as AEI works are progressively completed. Occupancy rate stands at 81.6% currently so there is lots of room to continue growing. FCT has provided me dividend income of about 6% p.a. Dividend yield is about 5.4% at current prices. It is trading at a price to book ratio of 1.08x which is slightly above its net asset value. I wouldn't consider accumulating more at this point but will continue to hold this for dividend income.